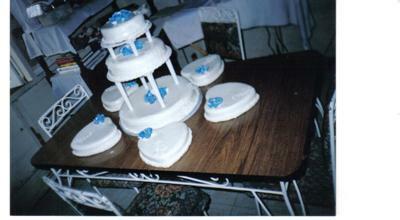 cakes with perrywrinkle blue roses made out of flour paste. Also, draw in some flowers vines with white butter icing around the base of the circle ones and at the point of the heart ones. I love this cake. The heart shape ones add a good kick to it. good job. VERY PRETTY AND NICE JOB!